Momofuku fried chicken is chef David Chang’s approach in which you steam chicken before frying it and then you douse it in a Korean-inspired vinaigrette. It’s unfailingly crisp-skinned on the outside and tender within. Genius as well as gluten-free. 1. Combine the water, sugar, and salt in a large container with a lid or a large freezer bag and stir until the sugar and salt dissolve. Pat the chicken dry. Add the chicken pieces to the brine, cover or seal, and refrigerate for at least 1 hour and no more than 6 hours. 2. Set up a steamer on the stove. Drain the chicken and discard the brine. Put the chicken in the steamer basket (if you are using a stacking Chinese- style bamboo steamer, put the legs in the bottom level and the breast on the top). Turn the heat to medium and set the lid of the steamer ever so slightly ajar. Steam the chicken for 40 minutes, then remove it from the steamer and place it on a cooling rack to cool. Then put the chicken in the refrigerator, uncovered and preferably still on the cooling rack, for at least 2 hours or up to overnight. As touted, this is not your traditional fried chicken; yet, this recipe serves up the same salty, savory satisfaction of biting into warm, juicy, crispy chicken. I can only imagine now how divine it would be in the restaurant. The Octo Vinaigrette is a hauntingly familiar concoction that makes you ask yourself “How come I never put vinegar on fried chicken before?” Serve this version of fried chicken to your friends and you’re a superstar. Oh, and did I mention it was ridiculously easy? I would stick with Chang’s direction to cut the chicken into four pieces. I broke the meat down into the traditional eight and found the chicken shrunk quite a bit when steamed. I think keeping the pieces intact minimizes the shrinkage. The Octo Vin softens the crisp skin anyway. I used a stainless steel steamer basket in a pot and that worked just fine. I served it with Sriracha hot sauce which put it over the top. I debated marking this as a TC since there are quiet a few steps and waiting periods in making this recipe but my family agreed that if I made this again they’d happily devour the results. We all decided it’s worth the extra effort to make this dish. We also all agreed the Octo Vinaigrette would be great on almost anything. My daughter put some on corn we had and declared it very tasty. I couldn’t find a bird’s eye chile at the two stores I visited and my daughter went to three more also with no luck so we substituted a serrano chile. I got the smallest whole chicken our market had and it was about 5 pounds instead of the 3 to 3 1/2 pound size suggested by this recipe. I opted to cut mine in 8 pieces instead of 4 and steamed in my Chinese bamboo steamer for the suggested 40 minutes since I had a bit more weight than called for. I also fried in two batches for 8 minutes and it was perfect — moist, juicy, a bit spicy but delicious. Love the Asian flavors but didn’t care much for the skin since after tossing with the vinaigrette as the skin lost its crispness. I'm a little sheepish to admit that this bird never made it to our table. My guy, E, and I were so taken with the fried chicken, we stood and devoured the obscenely crisp skin and supple, tender meat straight from the oil-stained brown paper bag where it drained. Holy Momofuku, it was gooooood. The skin wasn't just crisp, it was get-down-on-your-knees-and-thank-David-Chang crisp. And the brine lent a faint but welcome sweetness to the chicken, underscoring and not obscuring its innate chicken flavor. Something really lovely also happens to the texture of the chicken, making it plumper, firmer, moister, but not so juicy as unbrined birds. And the whole production was unthinkably easy. I used a scant 1/2 cup each salt and sugar in the brine. I was hesitant to steam the bird for a full 40 minutes as the recipe states, but the timing was perfect. Do be mindful to keep the water at a gentle simmer and to keep the steamer cracked, as the recipe instructs. The timing was also impeccable in terms of the 6 to 8 minutes in the oil, although be careful with the exact temperature of the oil. I had to reduce it a nudge as I like my chicken more golden than brown, and the sugar in the brine makes the chicken especially prone to browning quite quickly. This recipe has turned me into something of a fried chicken fool, as I went out the next morning and bought another hen to make exactly the same, so saddened was I at the prospect of no leftovers. I was quite content with the fried chicken alone, although my husband preferred it with the Octo Vinaigrette. It's also perfect with quick pickles. A keeper. Update: I've since gone back and tried the recipe with various cooking fats, including peanut oil, bacon drippings, and, um, lard. I still prefer the mild grapeseed oil as an unobtrusive component of the recipe. Everything else just felt too much. The results are in and this family gives it a solid “10”! We are not fried food eaters, but this is one fried chicken that you must try. Make sure you take the time to follow the directions precisely, as you will love the results. The simple brine keeps it succulent and moist, and the steaming gently cooks the chicken and readies it for a quick fry the next day. I’m sorry to say I didn’t make the Octo Vinaigrette because I forgot to pick up some of the ingredients at the store. Oh well! It doesn’t need it. Although I will try it the vinaigrette the next time—and trust me, there will be a next time. WOW…. long process but worth every second of it. I had tried other fried chicken recipes, which were VERY good, but I must say, this one turned out to be my favorite. Tasty, juicy, CRISPY! I could not believe how crispy it became, even with the vinaigrette, which was surprising as the two blended beautifully. I decided to try both the leg and the breast and must admit I preferred the latter, which was a shocker for the whole family as we are dark meat eaters. I think this will be the choice for fried chicken in our home from now on. This recipe is a keeper. The deeply browned, crisp chicken just works with this intensely flavored tangy sauce. I made it for visiting family and thank God we were family! The hands kept dipping into the sauce—double-dipping, I might add! The recipe didn’t call for flouring the chicken, but I would like to have seen how it would have come out with a light dusting of flour. Nevertheless, the skin was still crispy. This chicken is simply amazing. The brine is simple to put together and takes only a matter of minutes. I used an organic chicken and had the butcher cut it into 8 pieces for me. I left the chicken in the brine for about 4 ½ hours. It only took 20 minutes to steam once removed from the brine. The mind-blowing element of this chicken is the Octo-Vin. It’s sweet, tangy, and light, with a delicate flavor that doesn’t add greasiness to the dish. We just kept adding the sauce to our chicken as we ate. I used a red jalapeño since I couldn’t find the specified pepper in local stores. This would be a fantastic weeknight meal as you can make the vinaigrette and cook the chicken ahead of time, leaving about 10 minutes of cooking time later in the week. A great recipe and one I will make again. I could eat this often. I don’t know how this compares to other Korean fried chicken recipes, but this has become the one we refer to as Crack Chicken. Given the addictive flavors of this dish, it may be more than coincidence that David Chang also has a Crack Pie at his restaurants. 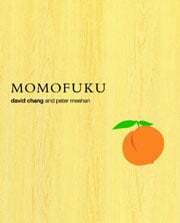 Momofuku's Fried Chicken Recipe © 2009 David Chang and Peter Meehan. Photo © 2009 Gabriele Stabile. All rights reserved. All recipes and photos used with permission of the publisher. Just before I received this posting, girlfriends and I were talking of fried chicken we have known and loved – most were in love with the buttermilk batter ilk. WELL – they don’t know what fried chicken love is until they try this recipe. After brining and steaming, I looked at that ghostly pale chicken laying on the rack in the frig and couldn’t imagine it would turn out to be this mass of crispy juciness. And it was so light and fresh. I used a bambo steamer basket for the alloted 40 minutes with a combination of halved breasts and whole thighs. I have a deep fryer, but needed to pump up the temp to achieve the nicely browned color. Hubby and I were going to go out for dinner the next night, but we both opted to stay in and have the leftovers, they are that good. How expensive are the poulet rouge? Expensive, Laura H. Exactly how much depend in large part on how you’re procuring it, whether from a local farmer, a local epicurean outlet, or an online purveyor that requires mail-order. Expect to pay the same as you would for a local, organic hen, which is to say around $15 for a 3ish-pounder. We hear lovely things about the poulet rouge, also known as the Naked Neck, from Joyce Farms, and we have one on order. We’ll let you know what you think. We suspect the price tag is worth it. Oh I was getting confused with the Label Rouge! I just Niman Farms also produces the poulet rouge. I would love to try it out! I do have a source of pastured organic roasters locally, but I am always curious. Thanks! Not only is this delicious, but it’s perfect for someone who’s craving fried chicken but is on a gluten-free diet! Exactly, Audrey. We didn’t want to shout it from the rooftops because we feel the taste is the primary reason to make this, and anyone who happened to be gluten-free would realize in a heartbeat that this is gf friendly. I count myself among those who’ve been mandated to be gluten-free, and I have to say, it’s the best fried chicken I’ve had. Hey Steve, completely agree, sometimes seeming misfortune leads us to fantastic things. I am a huge proponent of the steaming prior to frying so am really curious to hear how the parbaking works. Thanks for keeping us in the loop! Chicken sounds yummy, question do you leave it overnight in the fridge on the cooling racks covered or uncovered? Uncovered, P. You want the air to circulate as much as possible around the skin to dry it out. This results in insanely and cracklingly crisp skin after you pull the chicken from the oil. Not to distract from David Chang’s Fried Chicken, but the steam and fry method is not original to Momofuku –it’s the method originated by Harlan Sanders for Kentucky Fried Chicken. The KFC version fully cooks the chicken in a pressure cooker first and then deep fries it. That’s why when you order KFC it’s “fresh fried”–into the fryer for a minute or two before it gets to you. The decades old method was a culinary break through for tender chicken and for Fast Food. Nice to see that David Chang has enlarged the flavor profile! Suzanne, if I remember correctly, he didn’t steam and fry his chicken but rather pressured fried it. It’s a different method. Which was and still is an ingenious method. Thanks, Suzanne! I believe David Leite is correct regarding the pressure frying. Although what David Chang’s approach shares with what you suggest is that he, too, came up with his steam and fry technique out of necessity so that the already-cooked chicken could be “fried” and served warm in a matter of just a couple minutes without taking up too much time or space in a small crowded restaurant kitchen. Had the chicken not already been precooked, it would have taken a prohibitively long amount of time to fry each batch of chicken to order. Also, the genius Chang brings to this recipe is that he allows the chicken to dry overnight, uncovered, in the fridge, which crisps the skin to marvelously crackling effect. I hope you try the recipe!